45 min flight from Caracas, 45 min from Puerto La Cruz, Margarita Island is strategically located on the Southern Caribbean Sea. With a surface of 930 sq.kms has 244 kms of sea-coast, Margarita is the island with more beaches (wild & quiet) in the Caribbean Sea only surpassed by the giant Cuba. Its climate, being typical of the tropic, is tepid and windy, with temperate at 25-30ºC (78-86ºF). 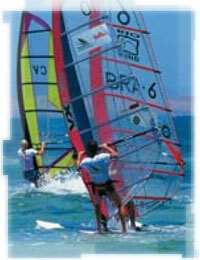 Margarita records: El Yake beach is considered between top-3 places in the world for windsurfing with periodically international competitions; 2 National Parks and 3 National Nature Reserve.